Odontoglossum. 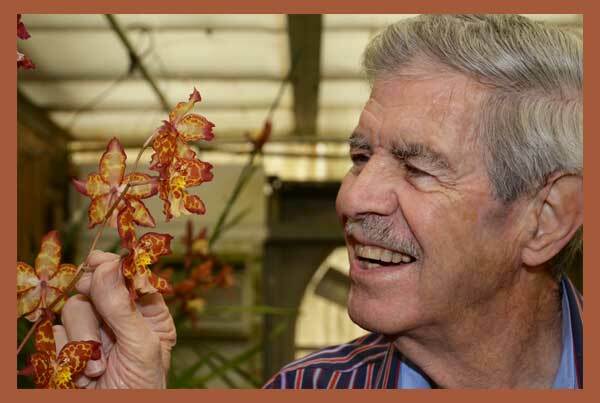 Standard Cymbidiums however, are another story. All the species are diploids and have the same chromosome count. So in theory, it should be a fairly easy matter. Of course, it's not so, especially when you start hybridizing with Cym. ensifolium, which has been the species which gives us the characteristics that we want 1) heat tolerance since it blooms in the summer, in fact the hotter, the better; 2) smaller plant size; and 3) fragrance. It is certainly the #1 species in our hybridization program. The downside is that Cym. ensifolium and the members of the ensifolium alliance, do not give a lot of progeny when they are crossed with the standard Cymbidiums, which come from 6 or 7 species from the Himalayas, Sikkim and Nepal. When you make these crosses, you either get no seed or, in the best of cases, only 50 to 200 plants out of the cross. The plus side of using Cym. ensifolium in our breeding program is the frequency of bloom. Ensifolium, which wants to bloom in the summer, when combined with modern standard Cymbidium hybrids that normally want goldcym.jpg (11348 bytes) to bloom in the winter, will produce progeny that will bloom at any time of the year. An example is Cym. Golden Elf, which blooms in both summer and winter. In fact, I have a plant in a seven inch pot, which has been continuously in bloom for over 18 months! That's what can happen, everblooming Cymbidiums from ensifolium crossed with a standard hybrid. Cym. Tender Love is a cross which we made between Cym. parishii and ensifolium, which are two of our best species, and it blooms not all of the time but at least three or four times a year. At Everglades Orchids we strive to produce hybrids that are easy to bloom and easy to grow under diverse cultural conditions. Many bloom several times each year with long-lasting flowers in a rainbow of brilliant colors. The majority of our Cymbidium collection was purchased by Carter & Holmes of Newberry, North Carolina www.carterandholmes.com. 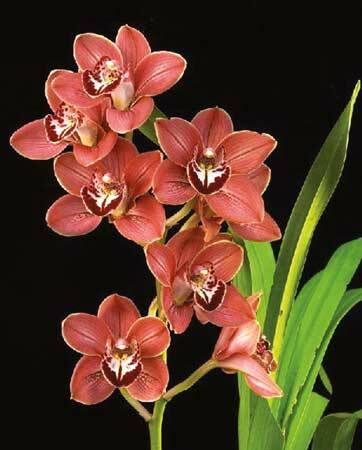 in the future, new Cymbidium hybrid seed will be sent to Carter and Holmes.